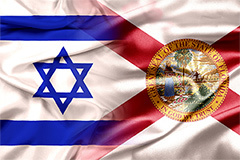 This August, the Florida legislature as well as Florida Governor Rick Scott has made clear that our state stands with Israel. We are deeply grateful for their powerful statements and continuing support for the well-being and security of our homeland. “As the crisis continues in the Middle East, Florida stands with Israel and specifically recognizes Israel’s right to defend all Israelis against acts of violence from Hamas. “Israel’s fight to end the senseless terrorism and violence of Hamas should unite all Americans. We must not pretend that this issue is ‘complicated’ as many pundits suggest. One thing here is not complicated at all: Hamas wants to destroy Israel. Hamas are the perpetrators. “Support for Israel is a moral issue, above politics. I agree with Congresswoman Debbie Wasserman Schultz’s assessment that there are ‘way too few, lone voices around the world criticizing’ the continued violence from Hamas. That the Florida House of Representatives reaffirms its support for Israel's right to defend its citizens and to ensure the survival of the State of Israel, condemns the unprovoked rocket attacks aimed at Israel, and calls on Hamas to immediately cease all rocket and other attacks against Israel. BE IT FURTHER RESOLVED that a copy of this resolution be presented to the Consulate General of Israel to Florida and Puerto Rico in Miami as a tangible token of the sentiments expressed in this resolution.